Set on an 18 acre site, approximately one mile to the south of Barnsley town centre, this site was opened up to its full potential by a the introduction of a new signalised junction on Harborough Hill Road and the diversion of overhead power lines around the site’s perimeter. It is an out of town retail development consisting of both new and refurbished ‘shed’ units in an ‘L’ shape configuration. This optimises visibility and maximises cover to provide a floor area of over 150,000 sq ft with individual units sizes ranging between 5,000 and 32,000 sq ft. These are served by over 600 customer car parking spaces. The tenant line up includes Focus DIY, JJB incorporating a fitness centre and indoor pool, Curry’s, Au Naturale and Pets at Home. 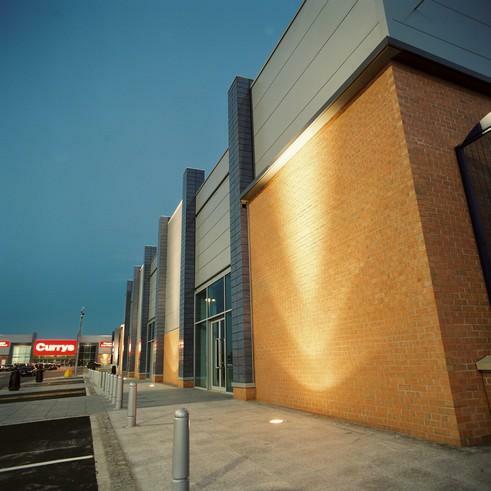 Construction was sequenced to allow continuous trade to existing tenants throughout.